I’ve had burgers on my mind lately. The warmer weather that has settled upon us over the last couple of days may be luring my thoughts towards grilled foods. The other possible reason for the craving is that I smell a certain fast food restaurant’s burgers frying as I exit the freeway each morning on my way to the office. The memory of those smells becomes a strong pull when, by 2 pm, one still hasn’t had lunch. I’ve succumbed once or twice in the last few years, though it’s far from a habit. The guilt after eating a greasy fast-food burger is too strong to make it so, but I would by lying if I didn’t admit it. It seems there are two sides to my foodie persona–there’s the Dr. Jekyll side whose normal diet is healthy and balanced (the food you see here). Then there’s Mr. Hyde and well, now you know where he heads on the rare occasion he comes out. Thankfully, there’s not an ounce of guilt to be felt with the burgers I made this week. I even made them mini-size. Instead of broiling my salmon and serving it with a salad and/or rice, I turned it into little sliders. I took inspiration from some sushi ingredients and used wasabi powder, soy sauce, rice vinegar, ginger and scallions to spice up the salmon with tasty results. I even served them with avocado slices, pickled ginger and wasabi mayo to further amplify the sushi-like experience. These little sliders were such fun to eat, but the best part? My burger cravings were satisfied–even my inner Mr. Hyde was happy. In a medium bowl, stir together the soy sauce, vinegar, grated ginger, salt, wasabi powder, sesame oil and both onions. Taste and add more of any ingredient as you wish. My proportions above yield mild results. To the mixture, add the egg and beat lightly with a fork. Prepare the salmon: I used a mini food processor to chop 1/4 of the salmon fillet finely (but not smooth). Add to the egg and seasoning mixture. For the remainder of the salmon, just roughly chop it in the food processor until you get little pieces. Also add to the mixture. Add the bread crumbs and use your hands to incorporate all the ingredients together. Divide the meat into four and shape them into patties. Heat up your gridle to medium high. 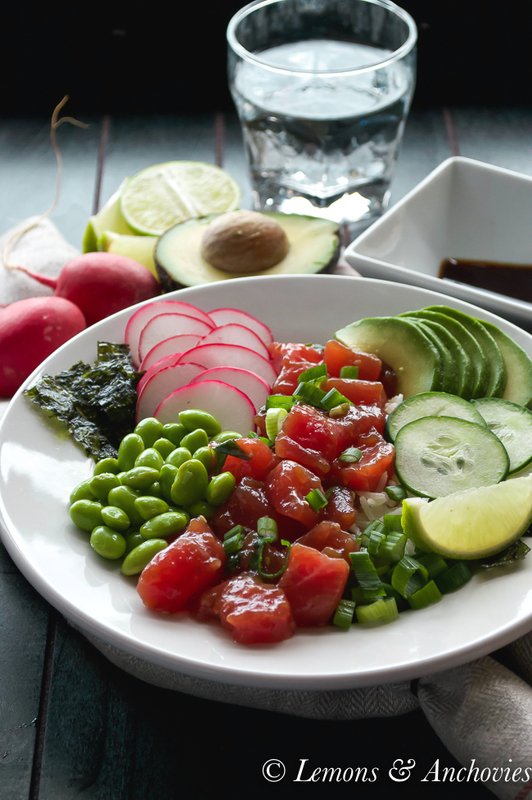 While you’re waiting, you can prepare your wasabi mayo by stirring all the ingredients together in a small bowl. Once the grill is hot, cook the salmon patties for 3 minutes on one side then flip for another 3 minutes. (Cooking times may vary based on the grill you use). Toast the buns on the griddle once one side of the salmon is cooked. Arrange on a plate and garnish with the toppings. Yum, a salmon burger with Asian flavors sounds delightful. 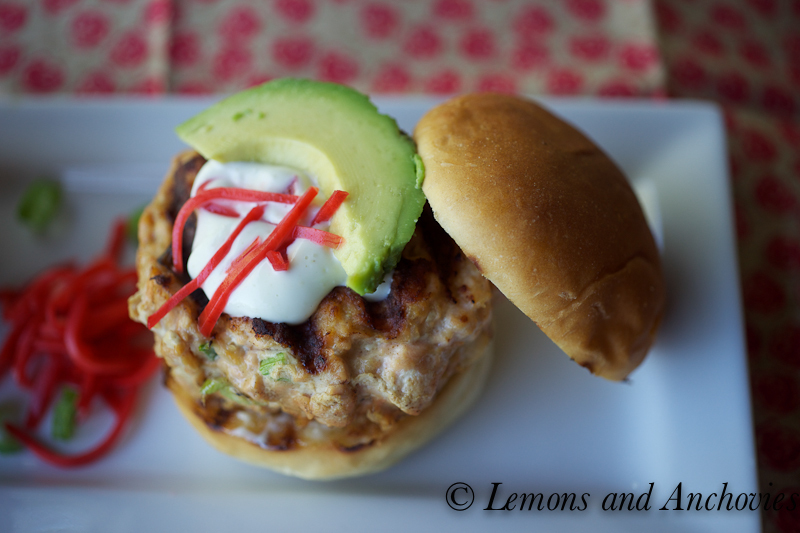 Jean, I love my uncle’s salmon burgers and I am so happy to see you post this! 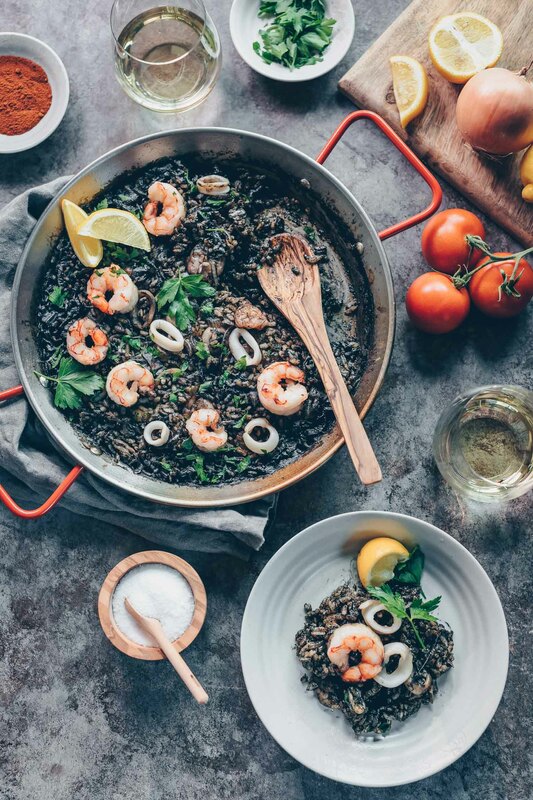 Your recipe uses asian ingredients that I love and I know I would enjoy trying this. My uncle keeps his recipe pretty simple and I wish he would make them for us again soon because I love eating salmon burgers but have never tried to make them myself. 🙂 Have a great weekend! MMM! I’m loving little sliders lately. My husband and I have been going to the farmers market where one of the trucks makes the most awesome lamb sliders that we can’t seem to get enough of. My husband would be all over these little guys too, I think he would name wasabi as one of his favorite flavors. I’m saving this one! I’ve never had lamb sliders, Kim. Must try that sometime–it sounds so good. The wasabi amounts I suggested here don’t make for a spicy burger so if your husband likes it a lot, there’s room to add more. You did the right thing taking a detour and not broiling the salmon. I love the truly Asian flavours you’ve used. The best part though is the wasabi mayo and of course the bun. Truly scrumptious! Delish!! 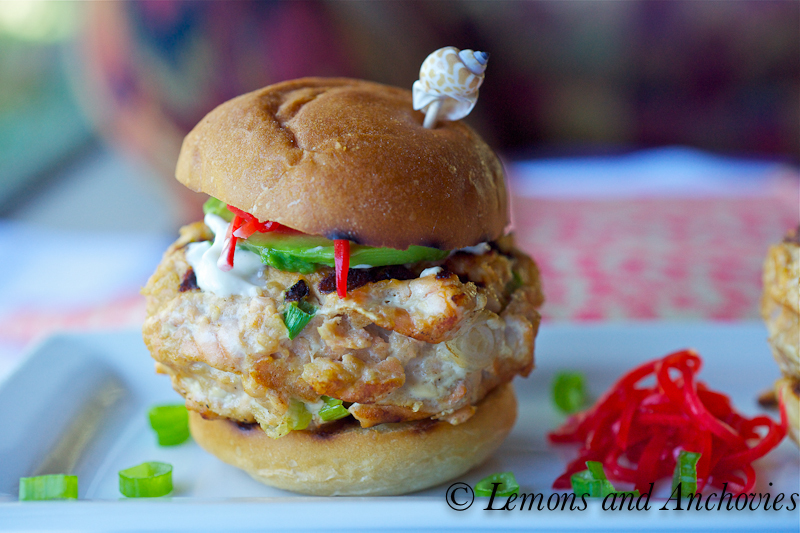 I would love to make these salmon sliders this weekend!! So summery . Sushi in a bun! An excuse to make even smaller buns again!! Thx Jean for inspiration! These look and sound delicious! Salmon + wasabi mayo sliders in miniature = almost too cute to eat 🙂 Love the seashell skewer on top. I have missed so much on your blog, Jean! Short days at school means I’m already getting ready to pick little dude up as soon as I get one thing done at home ;-). I’m glad I stopped by here before I head out to grocery shop. Thanks for fresh ideas! Oh I think we all have a little of Dr. Jekyll and Mr. Hyde in us when it comes to food but I guess most of us just aren’t ready to admit it. Oops! 🙂 These salmon sliders look absolutely amazing! I just love the idea. THIS is what I call a burger. Beats any fast food ANYTIME. Here was me thinking I was safe since I’ve just finished dinner. Just seen your photos and the descriptions and combinations have my mouth watering again. Ce n’est pas vrai! Oh how pretty!!! I don’t like salmon, but these look amazing! Hi Jean! What a great looking salmon burger! I love using pickled ginger but never thought of using it for salmon burger…this is really great. I don’t like wasabi (don’t laugh.. I’m still authentic Japanese!) but wasabi-mayo is really popular and nice idea to use for your burger! Have a great weekend! Your guiltless salmon sliders sound really good. I have to admit that I do love a good fatty burger with cheese and all once in a while 🙂 Have a great weekend! 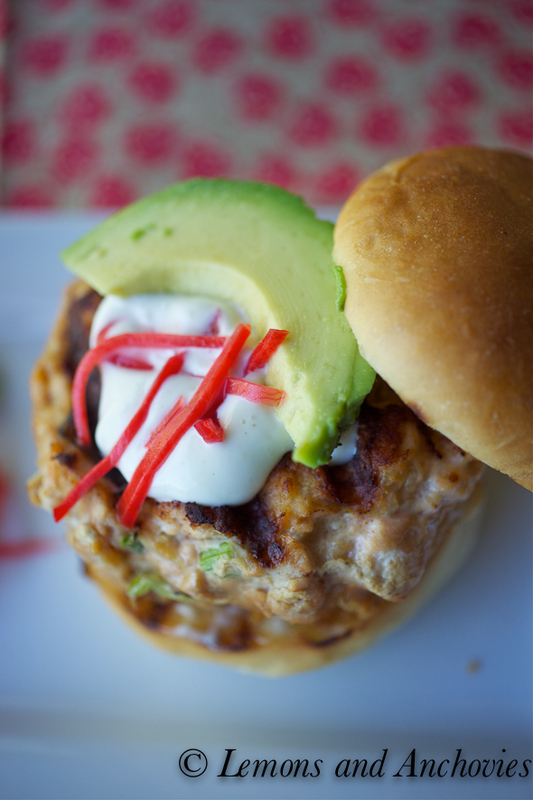 I’m not a big fan of normal burgers, but if you give me a salmon burger…I float up to culinary heaven. These are making me drool, and your photographs are just stunning! Thank you for sharing with me, my friend. Your words and creativity bring a big smile to my face. Love and hugs from Austin! Hi Jean! Discovered your Blog via Chef John about 2 months ago… Amazing stuff! I made these salmon sliders this evening for my spouse and I and my other half is still raving about them. I had all the ingredients except for the Salmon, so I ran out and picked up some Copper River Wild Salmon. Wow! These’s were GREAT if I don’t say so myself! I used a bit more wasabi and just to let you know 1 LB of salmon easily would make 8 sliders I made 4 regular size burgers so we will have the other two for Lunch tomorrow! Thanks for such a beautiful Blog. By the way my other half made me make your Bucatini with lemons and anchovies two nights in a row! Both are now staples in our home! Thanks for your shared talents! Your comment made me smile. I’m so happy you liked the salmon sliders. After reading your comment, I looked at my pictures again. Now I would tend to agree with you that one pound of the mixture would have made much more than just four sliders, LOL! They’re huge, aren’t they? I do think that more wasabi would be better; I found mine to be mild, too. 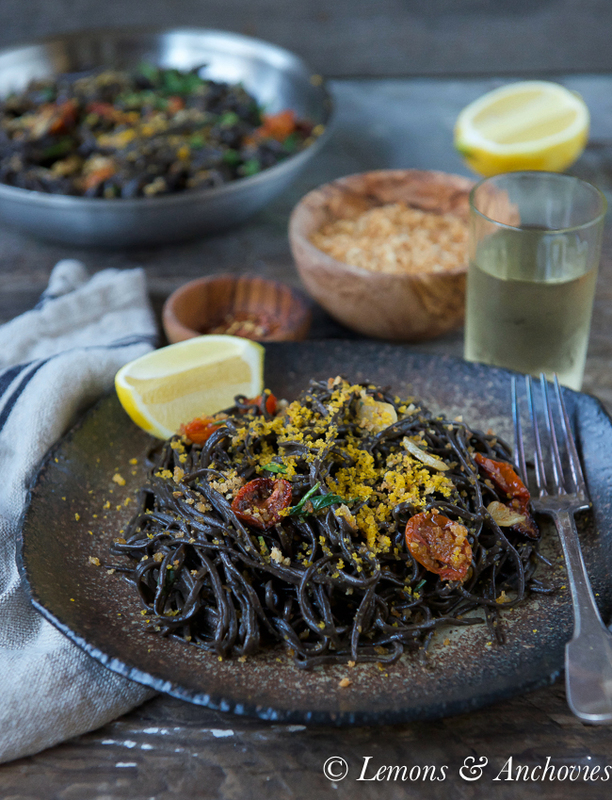 I’m so glad you like the bucatini dish, too. Yay! It’s music to my ears that you tried my dishes and enjoyed them! Thanks, again! These look awesome! What a great idea! 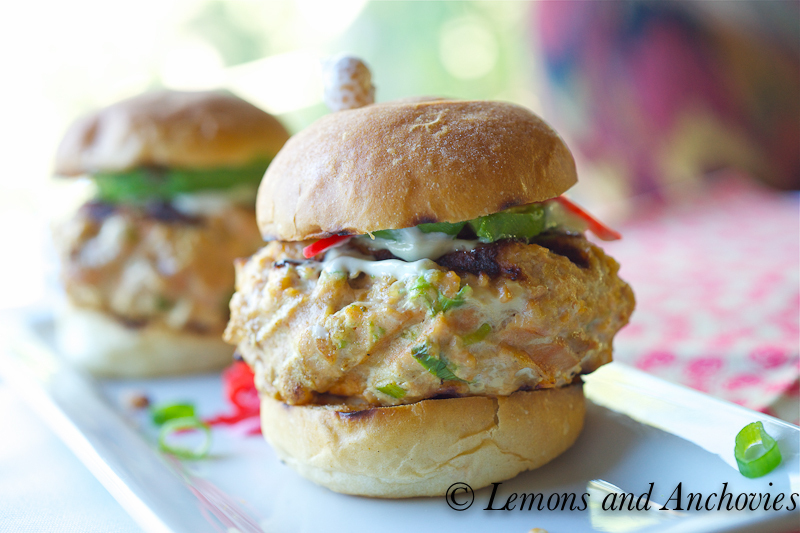 salmon sliders, oh what a great way to cool down for summer..light and tasty!! WOW! Talk about flavorful! They sound amazing! These look delicious! I will definitely be trying out this recipe. I don’t eat fish so I used tofu instead of salmon. They didn’t stick together very nicely but it didn’t matter – they were so delicious! !